While wrestling with a relatively large data set, visualised with Bokeh in an IPython/Jupyter notebook, I needed a way to show some "copy-pastable" text dump when making a box selection on the graph. Some kind of popup or dialog seemed ideal for this. I didn't want to spend too much custom code on it, let alone going down the overkill/overengineering path and add more libraries and dependencies to the mix. Jupyter as a webapp should have something like this under the hood somewhere, right? 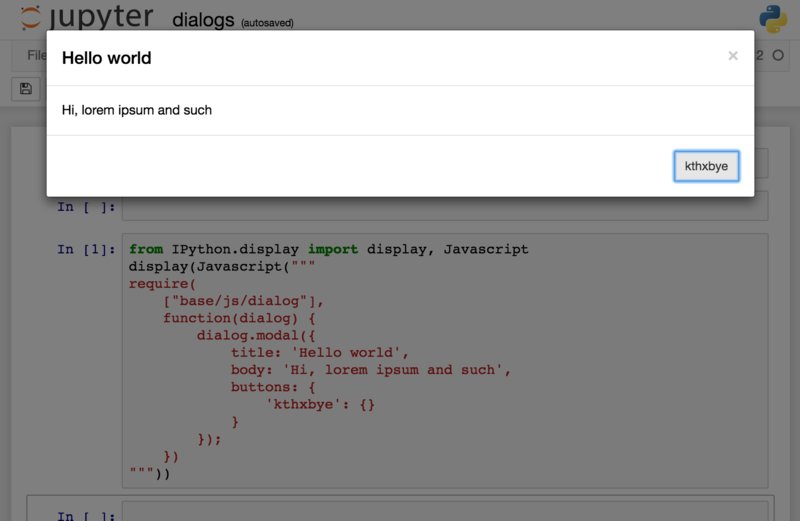 Jupyter indeed has an internal dialog module that can be leveraged as show below. Through RequireJs I load the internal base/js/dialog module and use the modal function to trigger a model with title and body.